If you teach for 30 years 7 to 8 of those years will be “Leap Years”. If you teach for 30 years in a self-contained classroom with 20 students per year, you’ll have taught a total of 600 children! 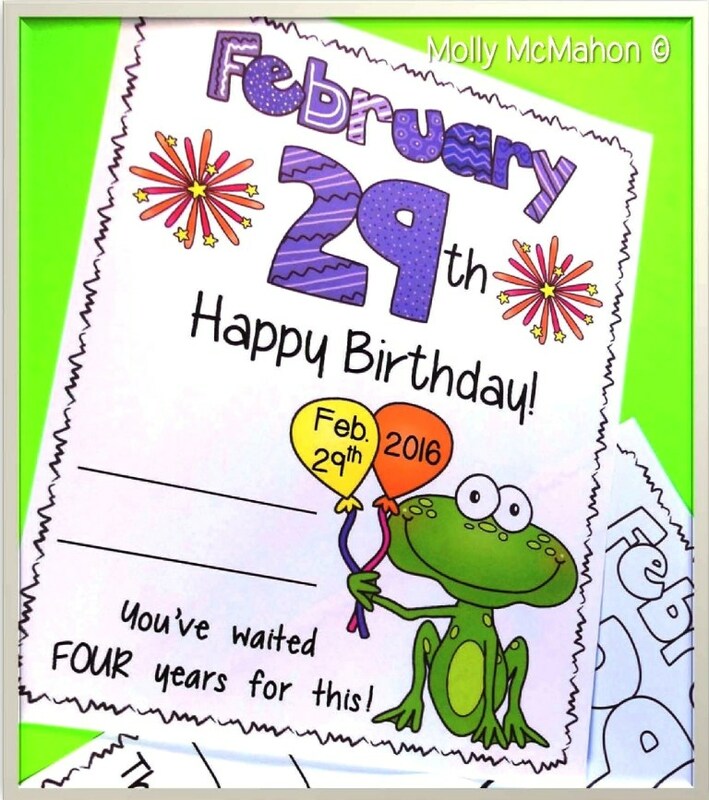 Odds are that you’ll have at least one child during your teaching career that will be born on February 29th. I’ve made a birthday certificate for that eventuality. There are color and black ink versions. 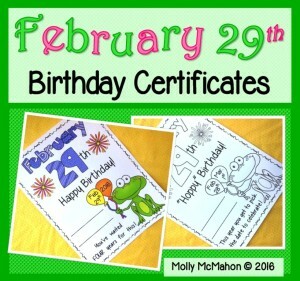 Some of the certificates can be used this year (2016) which is a leap year. I’ve also made some that can be used when it’s not a leap year. Click on the second image to download it from my Teachers Pay Teachers shop. Here’s some leap year trivia: Do you think leap year is every 4 years? Well, almost. While it’s true that a leap year must be divisible by 4, it’s not the only requirement. According to a Gregorian calendar, the beginning of a new century must also be divisible by 400 in order to qualify as a leap year. The year 2000 was a leap year because it’s divisible by 400. The next century will begin in 2100 and it won’t be a leap year! Copyright of Molly McMahon (Lessons by Molly). All rights are reserved by author. My products are licensed for personal and single classroom use only. This includes free resources as well as priced items. File sharing is not permitted. This item is not for public display on websites or other World Wide Web sources. The copyright holder and partners are the only entities which are authorized to display this resource. This resource is protected by the Digital Millennium Copyright Act (DMCA) as well as other applicable copyright laws.